If you have a gluten allergy you cannot eat any foods made with wheat, which includes a number of common food items such as pasta. However, a few food manufacturers make rice pasta as an alternative to wheat pasta that you can safely eat with a gluten allergy. To increase your intake of whole grains, choose brown rice pasta, which contains about the same amount of calories and nutrients as whole wheat pasta. Serving sizes on the Nutrition Facts label are standardized to help make it easy for you to compare items. A serving of Lundberg Family Farms spaghetti brown rice pasta is equal to 55 grams of dry, which makes about 2/3 of a cup cooked. 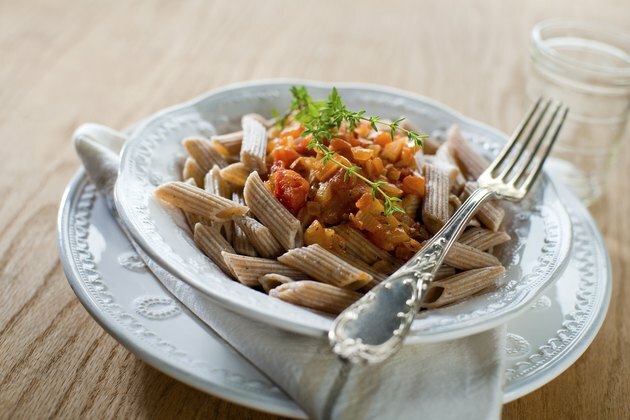 Each 55 gram serving of this brown rice pasta contains 190 calories. In comparison, the same serving of whole wheat pasta contains 191 calories. A 55 gram serving of Lundberg Family Farms brown rice pasta contains 40 grams of carbohydrates, 4 grams of fiber and 1 gram of sugar. Most of your calories should come from carbohydrates, according to the U.S. Department of Agriculture. Carbohydrates supply your body with energy. In addition to being a good source of carbohydrates, brown rice pasta also provides your body with fiber. Fiber in food takes longer to digest and helps to control hunger. Healthy adult women need 21 to 25 grams of fiber a day, and healthy adult men need 30 to 38 grams of fiber a day. Fats act as a concentrated source of calories and intake should be limited to 25 to 35 percent of total calories, according to the American Heart Association. In addition, your intake of saturated fat should be less than 7 percent of your total calorie intake. High intakes of saturated fat increase blood cholesterol levels and your risk of heart disease. Each 55 gram serving of Lundberg Family Farms brown rice pasta contains 3 grams of total fat and 0.5 grams of saturated fat. Each 55 grams serving of Lundberg Family Farms brown rice pasta contains 4 grams of protein. As a plant source of protein, brown rice pasta does not contain all of the essential amino acids, making it an incomplete source of protein. If you eat a varied diet that includes vegetables and whole grains you will more than adequately be able to meet all of your essential amino acid needs, according to the Vegetarian Resource Group. Healthy adult women need 46 grams of protein a day, and healthy adult men need 56 grams of protein a day.